While searching for a new blog title, but wanting to retain the personal connection of my actual name I remembered an incident many years ago. It was at a time when voice mail was done on a tape machine and not nearly as universal as today. I bought one thinking it would make me more accessible for sales. One of my wife's close friends, Judy Graham caught the voice mail several times and when she happened to catch me in person she would often say "Is this the real John Davidson" before getting on to why she called. This happened often enough that I got caught off guard when a young girl (I'm guessing teenager) with a similar voice phoned and started off with the exact same phrase, "Is this the real John Davidson?" My wife wasn't home and I decided to chat and carried on for awhile and finally assuming she was Judy, suggested she and her husband come over for dinner. Giggling took over and fairly soon the phone was hung up. Looking back it seems she was phoning celebrity names for a lark. So although people might recognize the name, I really am the real John Davidson. I don't use the caricature to hide behind, but it has become a brand. 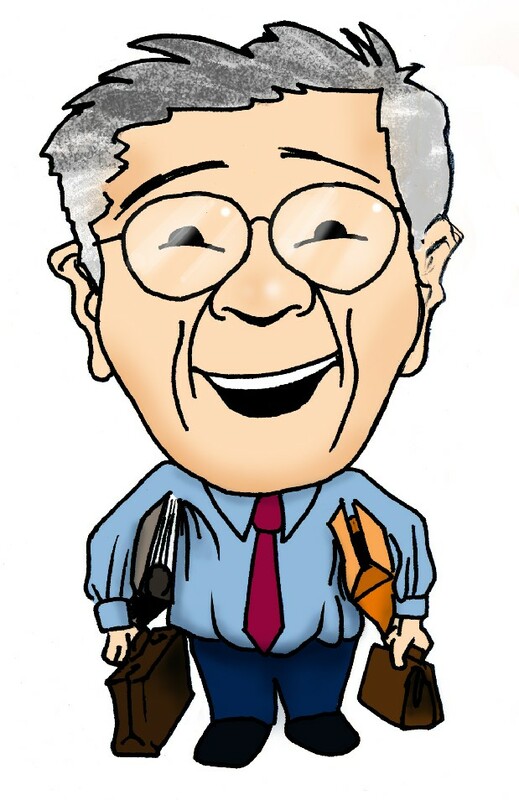 OKD Marketing where I have worked for over two decades decided on the idea of doing caricatures of all the staff to post on our website. I vaguely remember seeing mine (done by Eric Patte), feeling a bit insulted, but then forgot all about it. The design was based on the fact that I carried around a lot of stuff every day. I worked in two offices (often on the same day), took work home and worked on the road and often carried a laptop, a brief case, another bag with personal things and usually a lunch bag. Several months later I was trying to negotiate a deal with someone in Vancouver to sell lip balms and was trying to determine if he could provide the quality required. A week or so later he couriered a parcel to me, at a time when I was swamped with other projects so I put off opening it. He phoned a day or so later and I explained I would be opening it in another day or so and he insisted he wanted me to open it right away, so I did. Stunned was my first reaction as it took me a few seconds to identify the design he had chosen. It was my caricature which he had taken off the company website. I ended up using the design on several samples and worked with the manufacturer for maybe two years. I got to like it and have used it in several projects. I intend to keep using it, but will try to include photos of the "real" John Davidson more often. A big part of my blogging is just to express myself in what I think of as my unique perspective. My name has been used by many other people, some of them with a great deal more celebrity than myself. A long history resulted in my name and it fits a Scottish naming pattern. Basically the name has integrated itself into my sense of self. I am aware of a famous singer (I actually like him) and a famous hockey goalie and later commentator sharing the same name as well as many others, but I like to think I am unique. In my blogs it is my hope that any readers will get a view from the real John Davidson.